One of the best all day excursions from Rome is a visit to Lake Bracciano, Monte Gelato waterfalls in the Valle del Treja nature park, and the two tiny and well-preserved mediaeval villages of Calcata and Mazzano Romano. Motor racing fans might also wish to visit the famous Vallelunga racetrack in the same area north and northwest of Rome. 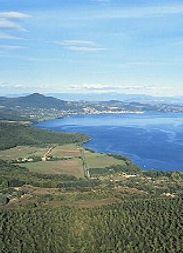 Lago Bracciano and its smaller neighbour, Lago Martignano, are very popular beach and water sport locations for Romans during summer weekends. Both lakes are of volcanic origin, hence their circular shape and great depth. Lake Bracciano has three towns and a number of villages on its shores while Lake Martignano is surrounded by farms. The Castle of Bracciano (Castello Orsini-Odescalchi), which is open to visitors, overlooks Lake Bracciano and is one of the most interesting castles in Italy. More about Lake Bracciano. 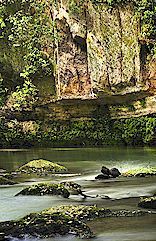 The park of Valle del Treja is focused mainly on the heavily forested gorge of the Treja stream which is the habitat of rare plants, birds and other animals, including a freshwater crab. There are also numerous traces of the Falisci, Etruscans and Romans in the area, for the most part necropoli. There are several well-kept walking paths through the gorge, including one starting at Monte Gelato waterfalls and passing along the floor of the gorge almost as far as Calcata. More about Parco Valle del Treja. At Monte Gelato, the Treja steam passes over a number of cascades among the trees. These waterfalls are quite attractive and worth a brief visit . They are more a favorite watering hole for local children during summer than a tourist attraction, although scenes from a number of films were also shot here. Nearby there are the substantial remains of a water mill that was in use from 1830 until the after the end of WW II. 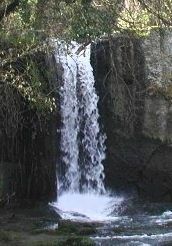 More about Monte Gelato waterfalls. 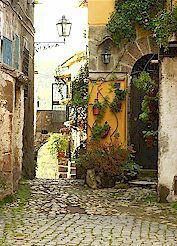 Calcata is effectively a village built inside a castle perched on top of a volcanic plug overlooking the gorge of the Treja stream. Aside from being one of the best-preserved mediaeval castles in Italy, Calcata is famous as a haven for Italian and foreign artists and others attracted to its bohemian lifestyle. Calcata was evacuated of its native residents in the 50s and now houses numerous art galleries and artisanal workshops, plus a few cafes and bars. More about Calcata. Vallelunga racetrack is now one of the most popular motor racing venues in Italy. 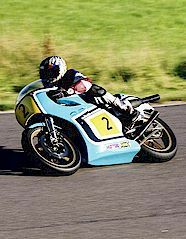 Not only are superbike and car events held here but it is possible to train on the track. More about Vallelunga Circuit. The town of Mazzano Romano is located on a high point above the gorge of the Treja stream, inside the Valle del Treja park, and is worth a brief visit for its 18 C vernacular architecture and pleasing ambience. More about Mazzano Romano. Vorresti pubblicizzare la tua attività su questo sito web per Mazzano Romano e Vallelunga e ricevere traffico in entrata dalla nostra rete di più di 50 portali relativi? Clicca qui per ulteriori dettagli in merito alla nostra soluzione integrata per una presenza su internet piena di successi.